Doris Lessing (r. 1919 - b. 2013), ag an bhféile liteartha lit.COLOGNE i gcathair Köln na Gearmáine sa bhliain 2007. 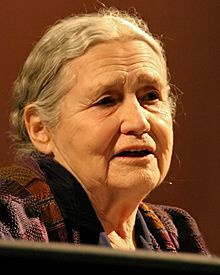 Úrscéalaí, file, drámadóir, leabhrógaí, beathaisnéisí agus gearrscéalaí ab ea Doris May Lessing CH (née Tayler). Do rugadh í ar an 22ú lá de Dheireadh Fómhair sa bhliain 1919 i gcathair Kermanshah na hIaráine agus do fuair sí bás ar an 17ú lá de Shamhain sa bhliain 2013 i Londain Shasana. Do bronnadh go leor duaiseanna uirthi, Duais Chuimhneacháin James Tait Black (1995), Duais David Cohen (2001) agus Premio Príncipe de Asturias (2001) ina measc. Do moladh Duais Nobel na Litríochta di sa bhliain 2007 agus ba í an duine is críonna a fuair an duais seo riamh. Is dócha gurb iad na húrscéalta The Grass is Singing (1950) agus The Golden Notebook (1962) na saothair is iomráití dá cuid. Tugadh an leathanach seo cothrom le dáta an 5 Márta 2016 ag 21:27.